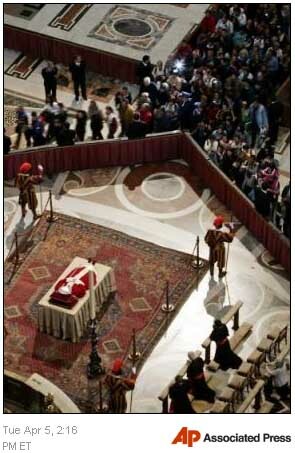 Swiss guards stand beside late Pope John Paul II whose body is placed for public viewing inside St. Peter's Basilica, at the Vatican, Tuesday, April 5, 2005. 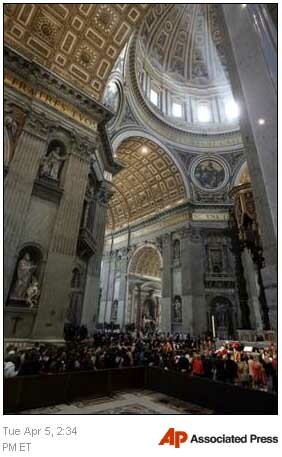 Faithful from all over the world have been queueing to pay homage to the pontiff. 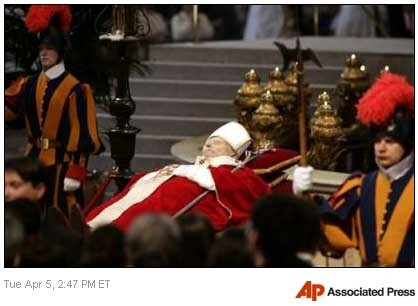 The Pope died on Saturday at the Vatican after a 26-year pontificate. 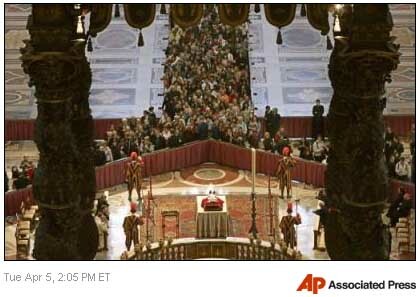 Faithful queue to say their last farewell to Pope John Paul II whose body is placed for public viewing inside St. Peter's Basilica, at the Vatican, Tuesday, April 5, 2005. Faithful from all over the world have been queueing to pay homage to the pontif who died on Saturday at the Vatican after a 26-year pontificate. 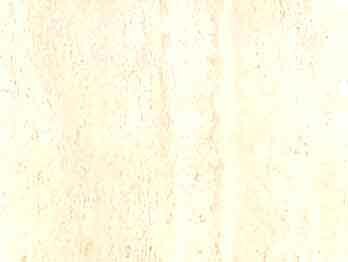 An undated file photo showing Pope John Paul II kneeling in front of the tomb, which according to the Catholic belief, is the tomb of St. Peter, located underneath St. Peter's Basilica at the Vatican. 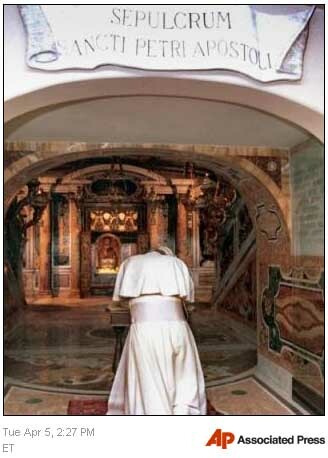 Pope John Paul II will be buried in a crypt adiacent to St. Peter's tomb inside the Grottos, where pontiffs throughout he ages, royals and even an emperor have also been laid to rest. Faithful pass by the body of late Pope John Paul II laid in state, inside St. Peter's Basilica at the Vatican Tuesday, April 5, 2005. Tens of thousands of mourners have queued to catch a glimpse of the body and pay their respects to the late Polish pontiff who died on Satuday, April 2, 2005. 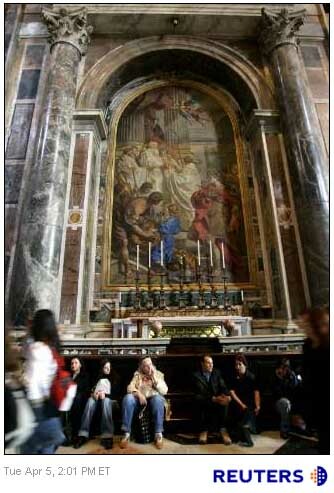 Faithful wait in a long line to see the body of late Pope John Paul II laid in state, inside St. Peter's Basilica at the Vatican Tuesday, April 5, 2005. Tens of thousands of mourners have queued to catch a glimpse of the body and pay their respects to the late Polish pontiff who died on Satuday, April 2, 2005. 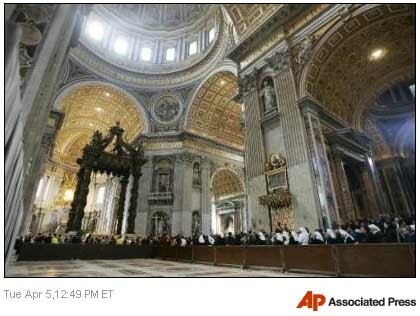 People rest inside St. Peter's Basilica after they passed by the late Pope John Paul II lying in state at the Vatican April 5, 2005. A swelling tide of faithful flowed past Pope John Paul's body on Tuesday in an outpouring of affection to repay the Polish Pontiff who reached out to millions during his 26-year papacy. 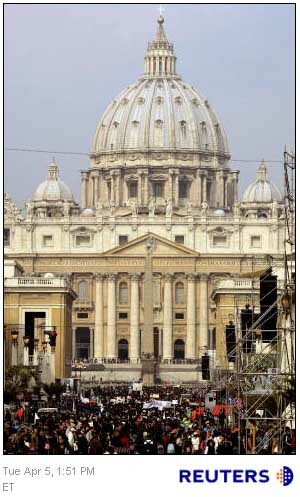 Thousands of pilgrims queue outside Saint Peter's Basilica to see the late Pope John Paul laying in state at the Vatican April 5, 2005. Up to two million people are expected for the funeral on Friday as well as almost 200 world leaders in an unprecedented salute for the pontiff. 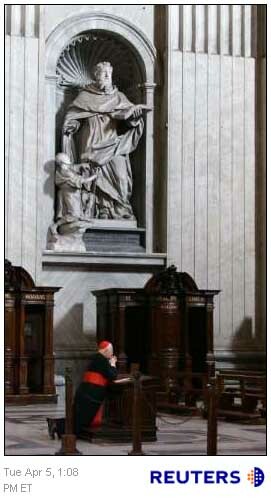 Cardinal Renato Martino kneels and prays under the statue of St Joseph Calasanctius as the late Pope John Paul II lies in state in St. Peter's Basilica at the Vatican April 5, 2005. A swelling tide of faithful flowed past Pope John Paul's body on Tuesday in an outpouring of affection to repay the Polish Pontiff who reached out to millions during his 26-year papacy. Faithful line up to see the body of late Pope John Paul II inside St. Peter's Basilica at the Vatican Tuesday, April 5, 2005. Tens of thousands of mourners have queued to catch a glimpse of the body and pay their respects to the late Polish pontiff who died on Satuday, April 2, 2005.